Welcome to Eagle Realty Group & Associates' website. The real estate market is comprised of buyers, sellers and agents. And, for the most part, has always worked in exactly that way. A buyer or seller contacts an agent who operates as a functionary piece of the real estate puzzle. The customer service may be good or bad, but most clients will accept this as a part of the business. Eagle Realty Group & Associates is changing all this. Real estate shouldn't be a list of perfunctory duties performed by disinterested parties; it should be a customer service experience unlike any other. After all, real estate is more about dreams and lifestyles, not just houses and properties. Eagle Realty Group & Associates, represents the evolution of real estate-the real estate consultant. The real estate consultant is the catalyst for quick sales and high profit, the professional who seamlessly blends the skills of investors, financial analysts and market experts in order to offer his clients premier service from beginning to end. The consultant educates and guides his clients through the real estate process, and is most concerned with their experience, placing their needs above everything else. If you are interested in a break from the norm, a shift from the traditional, then it is time to embrace real estate as it ought to be-an experience in integrity, service, and commitment. 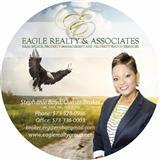 Eagle Realty Group & Associates is ready and waiting to serve you.